Total count (TC): Gene counts are divided by the total number of mapped reads (or library size) associated with their lane and multiplied by the mean total count across all the samples of the dataset. Upper Quartile (UQ): Very similar in principle to TC, the total counts are replaced by the upper quartile of counts different from 0 in the computation of the normalization factors. Median (Med): Also similar to TC, the total counts are replaced by the median counts different from 0 in the computation of the normalization factors. That is, the median is calculated as the median of gene counts of all runs. DESeq: This normalization method is included in the DESeq Bioconductor package and is based on the hypothesis that most genes are not DE. The method is based on a negative binomial distribution model, with variance and mean linked by local regression, and presents an implementation that gives scale factors. Within the DESeq package, and with the estimateSizeFactorsForMatrixfunction, scaling factors can be calculated for each run. After dividing gene counts by each scaling factor, DESeq values are calculated as the total of rescaled gene counts of all runs. Trimmed Mean of M-values (TMM): This normalization method is implemented in the edgeR Bioconductor package (Robinson et al., 2010). It is also based on the hypothesis that most genes are not DE. Scaling factors are calculated using the calcNormFactors function in the package, and then rescaled gene counts are obtained by dividing gene counts by each scaling factor for each run. TMM is the sum of rescaled gene counts of all runs. Quantile (Q): First proposed in the context of microarray data, this normalization method consists in matching distributions of gene counts across lanes. Reads Per Kilobase per Million mapped reads (RPKM): This approach was initially introduced to facilitate comparisons between genes within a sample and combines between- and within-sample normalization. 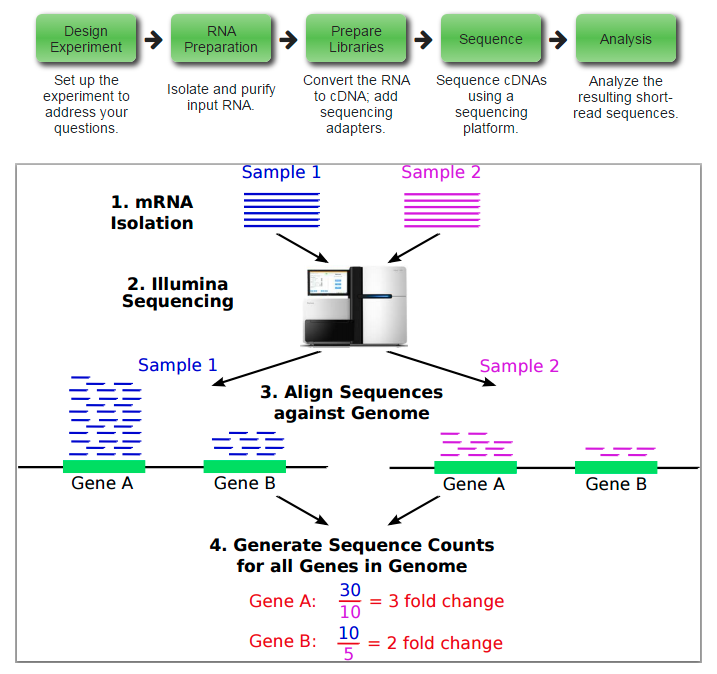 This approach quantifies gene expression from RNA-Seq data by normalizing for the total transcript length and the number of sequencing reads. For further downstream analyses, reads were quality-controlled using Trimmomatic, mapped to the humane reference genome using STAR, and intron-spanning reads were summarized using HTseq. This entry was posted in 未分类, 转录组软件 by ulwvfje. Bookmark the permalink.